High street jewellers Goldsmiths have partnered with TAG Heuer to release a stunning limited edition watch. This burgundy-bezeled TAG Heuer Aquaracer Calibre 5 is limited to just 250 pieces and is only available to buy from Goldsmiths' website and select stores. 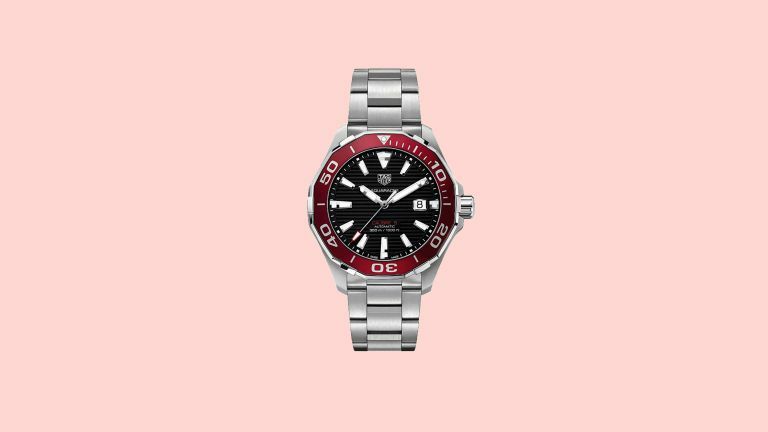 This is actually the second time the two brands have collaborated, the first time being last year, when the jewellers gave the Aquaracer a dark, sporty colourway. This year, Goldsmiths is bringing us an Aquaracer with a decidedly vintage feel. The unidirectional rotating bezel in burgundy looks great against the black dial with bold luminescent hour markers. It's incredibly attractive, but still highly legible, which is a nod to its origins as a tool watch in the demanding world of watersports. The original TAG Heuer aquatic timepieces were built to withstand everything the sea could throw at them, and that philosophy continues in today’s line-up. The Aquaracer Calibre 5 offers an impressive water resistance of 300 metres, and features a durable 43mm stainless steel case. Inside the case is TAG's Calibre 5 automatic movement, with a 38 hour power reserve. The watch is finished with a matching stainless steel bracelet and secured with a deployment clasp. The TAG Heuer Aquaracer Calibre 5 is limited to just 250 pieces, buy it now from Goldsmiths for £2,350.